If you have something new you want worked on, here's how to get the ball rolling – in the right direction. There are two primary ways to submit new requests: Jar's request submission form guides you through the information you need to submit a successful request. Your designer may also submit this form on your behalf. You may also submit requests by sending an email to requests(at)inbound.jarhq.com. Jar's pre-outlined form is a great way to outline a new request. It will take you through all the key pieces of information your designer will need from you to successfully fulfill your request. To get to the form, head to the "Requests" page and click on the "New Request" button in the upper-right hand side of your screen. You'll enter all the details of your request into this form. Be sure to fill out all the fields and check the box affirming you've uploaded all final copy and resources before submitting! 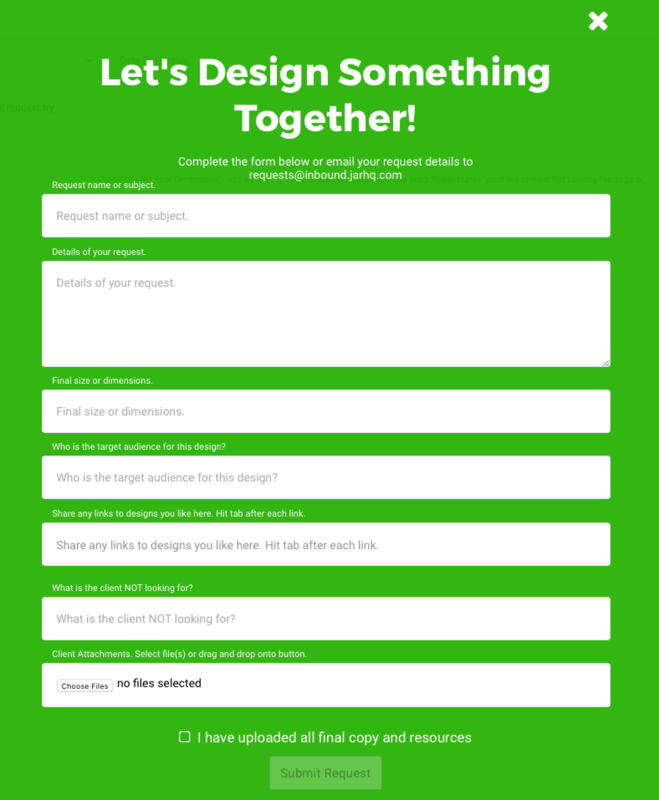 Let's cover all the information the form asks for and go over some examples of what your designer would like to see in your request. For example, "T-shirt Design for SXSW Event", "Sticker for Shipping Boxes", or "Facebook Ad for Spring Campaign"
Enter any information you would like your designer to know. This can include anything from copy and file types to color palettes and desired fonts. Anything you need your designer to know that isn't included elsewhere in the form should go here. 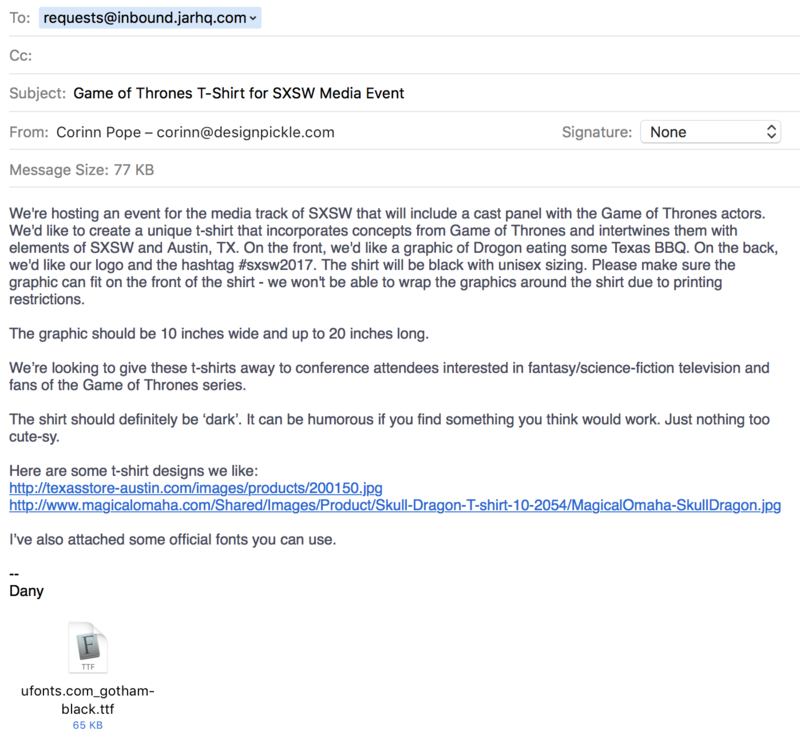 Here's an example for a t-shirt design for South By Southwest: "We're hosting an event for the media track of SXSW that will include a cast panel with the Game of Thrones actors. We'd like to create a unique t-shirt that incorporates concepts from Game of Thrones and intertwines them with elements of SXSW and Austin, TX. On the front, we'd like a graphic of Drogon eating some Texas BBQ. On the back, we'd like our logo and the hashtag #sxsw2017. The shirt will be black with unisex sizing. Please make sure the graphic can fit on the front of the shirt - we won't be able to wrap the graphics around the shirt due to printing restrictions." What size should the deliverable be? If you're looking for a specific size be sure to enter it here. For example "400px x 400px" or "12'x8'x2'" or "A4"
Who is the target audience for this design? Who is the intended recipient of the design. For example, the intended audience for a SXSW t-shirt may be conference attendees interested in fantasy/science-fiction. Share any links to designs you like here. Hit tab after each link. This is the space to share inspiration and things you like with your designer from around the web. Great inspiration makes your designer's job easier and is more likely to result in a design you'll like. If you're submitting a link with multiple graphics, be sure to indicate which one(s) you like in the details section of the form. If there's something you really don't like or a pet-peeve of yours you'd like to note, be sure to add it here. For example, if you're designing a Game of Thrones event t-shirt, in this section you would probably add something along the lines of "I'm not looking for anything too light-hearted and cute". Have specific images you want included? Certain fonts you want to use? A picture of a layout on a napkin you shot on your smartphone and want your designer to see? This is the section for it. You can either hit the upload button to open a file browser, or drag and drop files into the field to upload them. Requests can also be sent in via email. You can send a request in by emailing requests(at)inbound.jarhq.com. Just make sure you send it from the same email address you have registered with Jar!